A Friend For Life, For All Ages! Contact Form: To Learn More Write To Us Using The below Form. Thank You! Please Donate Whatever you can, any amount is needed to keep this vital project going, Thank you! When dreams are shared and a community comes together, anything is possible! 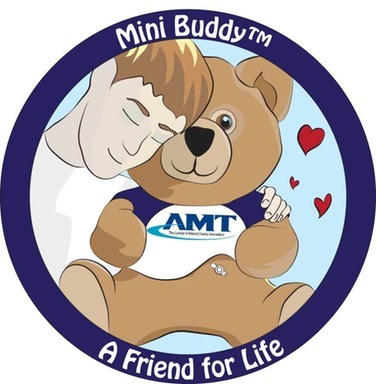 Mini Buddy is about much more than just delivering animals with medical devices to individuals with these medical devices or who will be getting one of their own soon. Our organization provides children, families, and caregivers with support and information necessary to help make the transition to living with a medical device as smooth as possible. Mini Buddy is striving to increase support groups in the communities where we have volunteers and partner hospitals. Our goal is to increase individual, family, and community support in each state. No one needs to go through this journey alone. No child needs to grow up believing that s/he is different from everyone else. The more we come together as a community the stronger our voice will become, and we will be able to do even more to help change the public perception of tube feeding. We are excited that we are working with AMT (Applied Medical Technology) and that our animals will feature their line of enteral products including the very popular Mini ONE button! They have been incredibly supportive of us from the very beginning and we are very thankful for all they have done to help make Mini Buddy possible. We love knowing that AMT’s products are still made in the United States and that they are continually striving to find ways to make tube feeding easier and more comfortable for children who rely on enteral feeds for survival.